These two books have become a part of our nightly routine. Back in August I felt very prompted to spend one on one time with my kiddos and the Lord. I wasn't sure if it meant just reading the scriptures with them or something more. Thankfully the Lord led me to these devotional books and our bedtime routine has become a part of the day we all treasure. 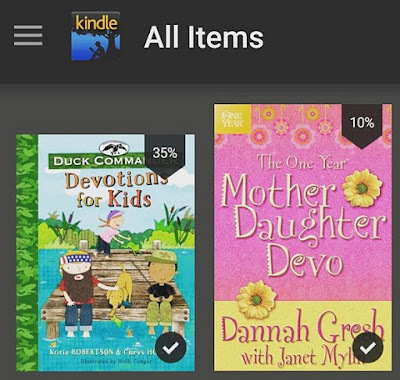 I am reading The Duck Commander book with Keagan and the One Year Mother Daughter Devotional with Libby. Both have amazing stories and scriptures shared daily that have opened up some great dialogue for the kids and I. They also get one on one time with Mom, which is their favorite. We read, talk, laugh, and enjoy some quiet time together. I'm truly thankful for the guidance the Lord offers me. I've been very humbled over the past few months. I have learned that God truly knows my children's hearts and what they are in need of. The time I'm taking now to establish a routine of us talking and reading will come in handy in the future. The more that our children see us listening to the small stuff, the more likely they are to trust us with the big stuff. Our kids are growing up in a tough world. They need to know they have parents that they can come to always. I'm far from perfect. I'm flawed greatly, but thankfully God see's the mother I can become. It is through His grace I'm able to do what I do. Good for you mama! And thank you God for giving you these precious children and the resources to be able to share his word! I will have to check these out too! Thank you for sharing! I'm a big advocate for parents reading to their children. It helps them later in life with reading and in English. My mom read to me a LOT when I was growing up. I remember when the Harry Potter books first came out and she would read a little bit at a time to me right before I went to bed or during bath time. This was also my 'reward' for getting all my night time routines done honestly (teeth brushing, ect). And because of this, I love reading books on my own. And you are right about that. I have a very open relationship with my mom and it continues to be open as I get older. My mom loves that I feel comfortable talking to her about anything, no matter how weird or awkward the topic may be. Keep doing what you're doing because believe me, it's making a huge impact on your kids! !